China’s Civil War officially ended in 1949 when the Kuomintang (KMT), led by Chiang Kai-shek, was defeated and fled to the island of Taiwan. But in reality, that was just the beginning of a three-decade confrontation in the Taiwan Strait, with both sides exchanging live fire, loudspeakers blaring political slogans and balloons airdropping propaganda leaflets. Wang Chengbin, a former Beijing Military Region commander who witnessed the 30-year standoff, told NewsChina what it was like to guard the frontier through a war of shells and words, and finally to peace. After the shelling died down, bullhorns fell silent and balloons were grounded, a rainbow of peace and quiet finally appeared above the strait at the beginning of 1979. In the early 1950s, Chiang Kai-shek’s forces launched limited attacks from Kinmen and Mazu against the coast of the Chinese mainland. Both sides viewed the islands as a potential launching pad for a KMT invasion to retake the mainland and had an interest in controlling them. 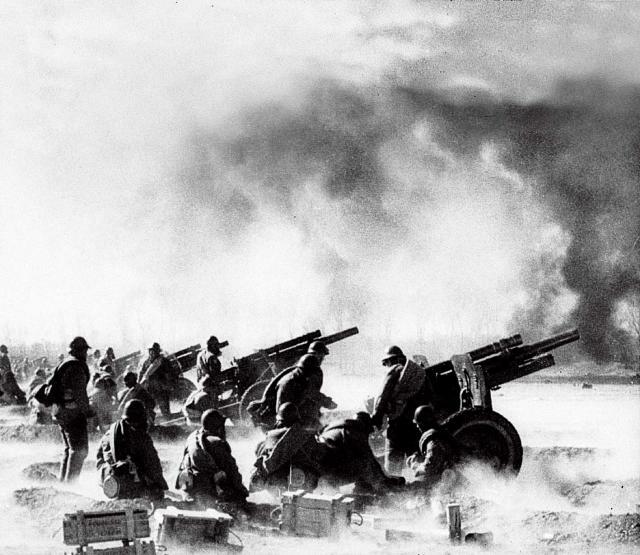 Tensions across the strait reached a climax in 1958 with the Kinmen Artillery Bombardment, also known as the 823 Artillery Battle. Kinmen, also called Quemoy, a Taiwan islet three kilometers from the Chinese mainland city of Xiamen, Fujian Province, has been a military base where for years Chiang concentrated his army to prepare to recapture the mainland. 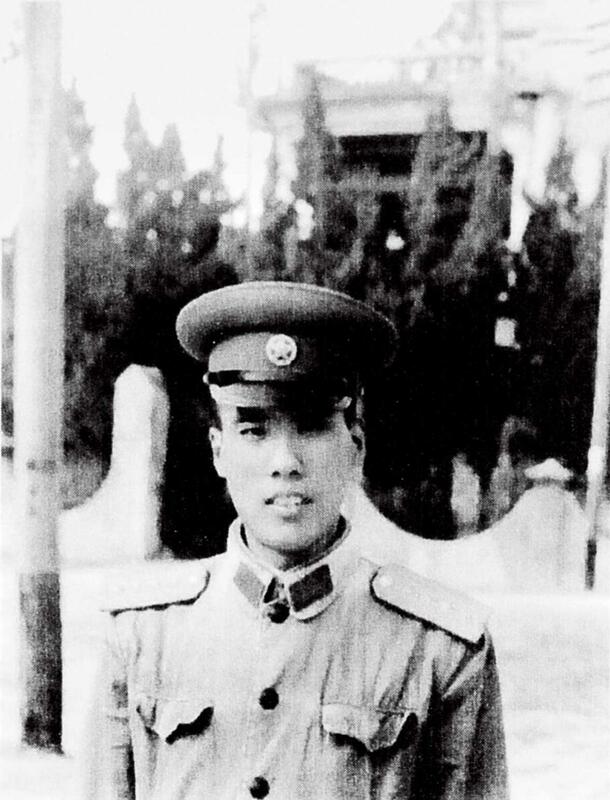 When the 823 Artillery Battle broke out, Wang Chengbin was Deputy Regimental Commander of the 271st Infantry Brigade, 91st Division, 31st Army. In 1958, the mainland had gradually finished building military airfields along the southeastern coastline. The newly opened Yingtan-Xiamen Railway connecting Jiangxi with Fujian provided convenient transportation and more frequent dispatches. As a result, the People’s Liberation Army (PLA) went ahead and gathered its forces to coordinate with the PLA navy along the seashore. There were air and naval skirmishes in mid-July. Wang recalled that the slogan “We shall liberate Taiwan” sonorously echoed at all levels. The 271st Infantry Brigade was fully prepared. Air skirmishes were generally brief, lasting about three to five minutes. Wang and his soldiers watched from below. Every now and then, they saw one or two fighters vanish from the air with a plume of black smoke, but it was impossible to tell who had prevailed until news of the situation was internally announced by the army each evening. tunnel entrance of the Kinmen Defense Command (KDC), killing two deputy defense commanders and wounding the Defense Commander Hu Lieh. Wang said it was Shi Yichen, Deputy Commander of the Fuzhou Military Region, that planned and organized the sudden attack. The tunnel entrance of the Kinmen Defense Command was located behind Mount Taiwu, a blind spot from the mainland. Precision bombardment was nearly impossible. important supply channels during wartime. Shi learned the exact position of the tunnel entrance after he interrogated a couple of spies from Taiwan. To prepare for a precise and sudden strike, he and his troops spent two days simulating a bombardment on a mountain geographically similar to Mount Taiwu with a 152 millimeter howitzer. Fujian, to make iron and steel. The ill-fated mass steel campaign had begun. It was part of the Great Leap Forward of 1958-62 led by Chairman Mao Zedong that aimed to rapidly industrialize China’s agrarian economy. Chinese society was mobilized to make iron and steel via any means possible, with the single-minded goal of surpassing the UK in production within 15 years. The military was a major part of this. But the artillery fire on both sides did not stop. It continued for the next two decades, ending for good in January 1979 after the US and the People’s Republic of China recognized each other. Firing would take place on alternate days of the week, but it was more symbolic after the 1950s, when the shells were replaced with propaganda leaflets. Wang told NewsChina that the frontier military tension resulted in thousands of families being torn apart. “Widow Village” on Dongshan Island was such a case. Dongshan is a county in southern Fujian Province, located along the Taiwan Strait. In 1950, at the end of the Chinese Civil War, the island was the frontline between the Communist Party and the KMT. From 1950 to 1953, as Chiang Kai-shek’s KMT forces retreated from the mainland, they took with them more than 4,000 men from Dongshan Island to help fortify an army that might someday recapture the mainland. The seizure of men left Dongshan reduced to “an island of widows.” In Tongbo Village, over 140 men, mostly married, were taken on one night. Nevertheless, the homesick conscripts were stuck in Taiwan, unable to return home for nearly four decades. Their wives were left to fend for themselves with little news of the men until tensions between the mainland and Taiwan eased in the 1980s. Another kind of war was being waged daily across the Strait, with different weapons. Both sides fought for psychological and ideological dominance, using loudspeakers to broadcast taunts and influence each other. By 1953, five radio stations targeting Taiwan had been established off the coast of Xiamen, the shortest distance between the mainland and Taiwan. In response, Taiwan built five stations in Mashan and Dadan, at the points where Kinmen is closest to the mainland. Both sides broadcast 24 hours a day, 365 days a year, fighting for dominance of the airways across the Strait. Enormous speakers blared propaganda-filled slogans and denunciations. The “Nine-headed Bird” is located on the eastern shore of Dadeng, an island of 20,000 off the coast of Xiamen. 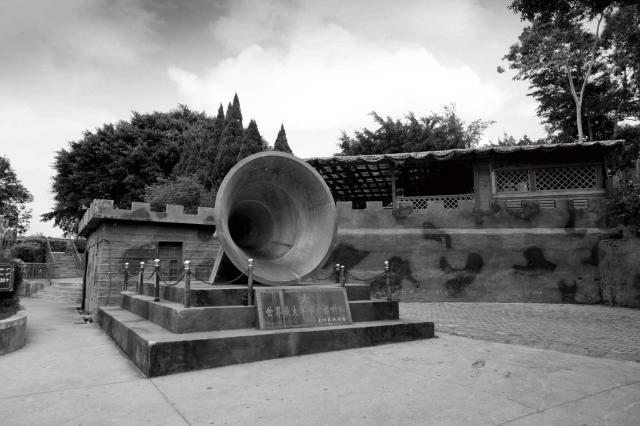 Designed by the Institute of Physics, Chinese Academy of Sciences, with a diameter of 2.28 meters and weighing 1.7 tons, it is said to be the world’s largest military loudspeaker. The noise from the massive speakers was clearly audible for 12 kilometers. 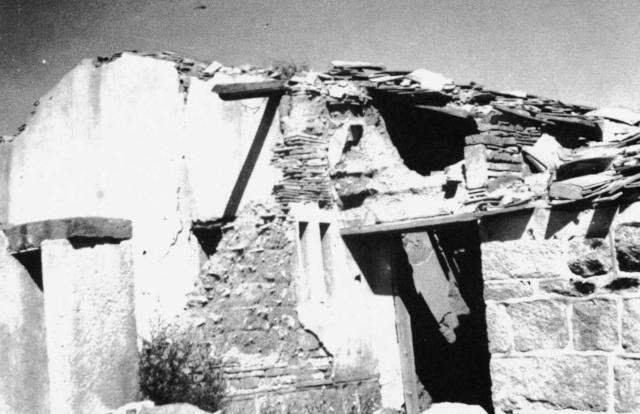 Each side’s speakers and broadcasting studios were regularly targeted by artillery fire. For the most of the 1950s, 60s and 70s, broadcasts from either side were full of political attacks. Many programs from the Taiwan side attacked Mao and the Communist Party, while others depicted the rich and happy life of the Chinese on the island of Taiwan. The broadcasts of the mainland side urged national unity and encouraged KMT soldiers and officers to return home to the mainland. Announcers would speak Putonghua first and repeat the message in the Fujian dialect, a language shared by people in both Xiamen and Kinmen. From the 1970s, both sides refined their tactics again. Taiwan began to mix in the songs of Teresa Deng, a Taiwanese singer known for her sweet voice and gentle love songs, to win the hearts of those on the mainland. While the mainland was mired in political turmoil and its economy remained stagnant, Taiwan witnessed rapid industrialization and high economic growth rates, becoming one of the four Asian Tigers. Artillery battles and broadcasts exerted limited influence. But what really struck the military and civilians on both sides was the battle of the balloons. In the mainland, balloon bases were established along the estuary of the Minjiang River and in central and southern Fujian Province. Taiwan located its balloon bases in the cities of Taipei, Taichung and Tainan. Autumn and winter were the best seasons for the mainland side to release rubber balloons targeting Taiwan, as they brought the west and north winds. In spring and summer, however, the east and south winds brought balloons from Taiwan at a slow and steady pace (except during typhoons). With the prevailing offshore winds, the balloons could reach the mainland in about two minutes. The balloons flew high and exploded, raining propaganda down onto the ground below. Scraps of paper and small parcels stealthily fell by the feet of passersby. The base had a huge factory six stories tall where balloons were inflated to the size of a house, with its ideological payload tied beneath. As the electric rooftop door opened, the balloon was pulled upward along the slide track. Once away it drifted up to the sky, and was carried on the wind to Taiwan. Taiwan Strait, and too late, the Pacific Ocean. Most of the material was political leaflets, but on special occasions such as the Mid-Autumn Festival and the Spring Festival, branded liquor such as Maotai and Wuliangye, Chunghwa cigarettes and many other local products were also carried along. For a time during the Cultural Revolution (1966-76), pocket editions of Quotations from Chairman Mao Zedong, also known as the “Little Red Book” were carried across the sea to Taiwan. The Taiwanese complained that they picked up too many little red books. One paper mill in Taichung made a request to the military for approval to let it destroy all these little books and turn them into recycled paper. Taiwan mainly airdropped leaflets too, but sometimes added sweets, cookies, toys and even watches. Often they would also drop palm-sized transistor radios which could only broadcast Taiwanese channels, as well as cassettes of Teresa Deng songs. PLA soldiers were strictly forbidden from picking up the leaflets, radios or any other items sent from Taiwan. Nevertheless, as Wang told NewsChina, the messages and photos were printed too large to ignore. One could see the content clearly just by glancing at it. As China began its economic reforms and gradual opening in 1978 in the shadow of the Cultural Revolution, tensions across the Strait began to ease. On January 1, 1979, the “New Year Messages to Compatriots in Taiwan,” issued by the Standing Committee of the Fifth National People’s Congress, marked an official end to the mainland’s shelling of Taiwan-held offshore islands and a shift toward the goal of “peaceful reunification” instead of “armed liberation” of Taiwan. The propaganda war ended soon afterwards.